There is a common misconception amongst people without disabilities that people with physical disabilities can’t – or shouldn’t – drive. After their initial invention in the late 1880s, the automobile became widely available in the 1920s with Henry Ford’s assembly line. Still, the popularity of owning cars didn’t explode in popularity until the mid-1950s. 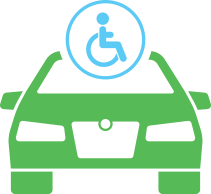 It is only in recent years that car companies became more interested in making their vehicles accessible for people with disabilities. However, people with disabilities have been modifying cars with their own inventions since the early 1900s. Frank E Fithen is considered the earliest pioneer of creating and using adaptive mobility equipment for motor vehicles. Fithen’s arms were amputated after a childhood accident. As a young adult, he redesigned his car with a series of rings on the steering wheel to accommodate his residual limbs. Fithen then drove across the contiguous United States, showcasing his driving skills at fairs and carnivals. At the time, many drivers didn’t like to go over speeds of one mile per hour. Fithen broke distance and speed records traveling at 58 miles per hour. Around the same time, future Judge Quentin D. Corley adapted his car’s steeling wheel with a steel hoop, enabling him to steer with the hook on his left hand. Coincidentally, Corley was injured in a childhood accident also involving a train, similar to Fithen’s. As a result of the accident, Corley lost most of his left forearm, along with his entire right arm and shoulder. Due to polio and the first two world war, the early twenties century saw an increase in people with disabilities in the U.S. After World War II, car manufacturers Ford and General Motors began to modify vehicles for wounded veterans. Eventually, they would include civilians with disabilities, as well. Senator Bob Dole was one of such wounded veterans. During combat, Senator Dole was injured from a gunshot wound. As a result of the injury, Dole was partially paralyzed on his left side and mostly paralyzed on his right. At some point, he was a spokesperson for the modification of the vehicles until the military put the kibosh on Dole endorsing the auto companies. for people with limited range of motion. allows for starting the vehicle by touch. people who are paralyzed from the waist down can use hand controls instead of foot pedals. moving seat back can enable wheelchairs to fit without removing the entire seat. doors can be opened or closed by remote touch. allows people who are deaf a wider range of vision; required in some states. for those with limited hand function. a more advanced version of the rings Frank Fithen used in his cars. for people who have weak or missing right legs/feet. Losing the ability to drive is one of the hardest pills to swallow for people with disabilities. Getting in your car and hitting the road gives you a feeling of freedom and euphoria. The open road, wind in your hair and the radio blaring is the quintessential rite of passage. People without disabilities are downright shocked when they find out that people who use wheelchairs – even paraplegics – can drive. The vehicles don’t come off the assembly line tricked out in assistive devices (yet). While some cars have the technology already installed for use by people without disabilities that can be adapted and manipulated by a person with disabilities, the cars typically require expensive modifications instead. Aside from making the van wheelchair accessible by installing ramps and removing seats, BraunAbility add additional features such as cabin and ramp lighting for navigating in the dark. 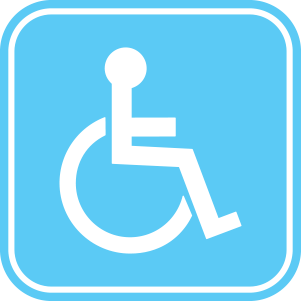 answer or send phone calls, request song or navigate all by the sound of your voice. get specific directions or search for nearby restaurants, gas stations, etc. for wide-use and up to 800-pound weight capacity. Removes front or rear seats to accommodate wheelchairs. enables ramp and lift to work in the event of a power outage. alerts when a collision is detected. tracks road markers via small camera and alerts driver if the car is about to leave the roadway. Alerts drive if the vehicle is in danger of crossing traffic lanes. dashboard interface includes a 7-inch screen with visual notifications. gears are changed by the touch of a button. A company that specializes in vehicle modification, Mobily SVM (Special Vehicle Manufactures) has made a dream come true for many people with disabilities. That dream? A wheelchair accessible truck. When you think of wheelchair accessible vehicles, you think of huge vans that fill those reserved accessible parking spots in grocery store parking lots. When fitting vehicles for mobility access, most vehicles require lowering the underbody to 4-inches from the ground. This negates the attraction of a pick-up truck – the height allows for traversing rugged land without worrying about damaging the undercarriage. 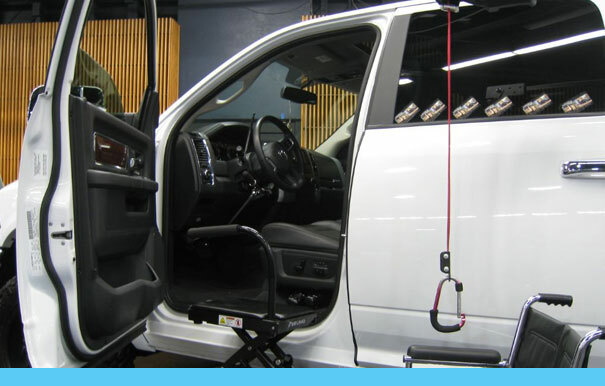 Mobility SVM makes it possible to lift wheelchairs directly into either the driver or passenger side of the vehicle, while preserving the truck’s 9-inch ground clearance height. How? The founders of the company designed and created a platform mobility lift that lifts the wheelchair (and the person sitting in it) directly into the vehicle. The doors open just 36-inches, leaving ample room to fit in non-handicap parking spaces. •Backseat remains in the vehicle, accommodating up to 5 passengers. •Fits wheelchairs up to 28-inches wide. While the big names in automotive manufacturing don’t yet make cars specifically with people with disabilities in mind, many of the leading car companies offer vehicles purchase discounts. 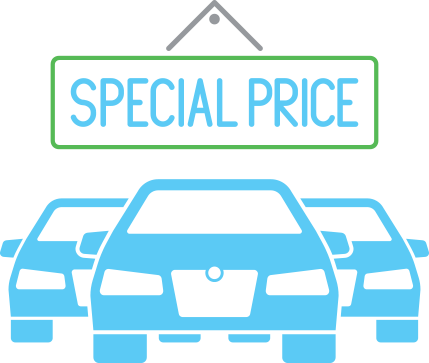 Modifying a car with assistive technology can cost anywhere between $20,000 and $80,000! That is essentially the price of TWO cars. The majority of the discount programs offer reimbursement toward adaptive technology. up to $1000 in adaptive equipment assistance in new Ford, Lincoln or Mercury vehicles. reimburses up to $1000 in adaptive equipment in new Volvos. cash reimbursement up to $1000 for adaptive or conversion equipment on new Toyotas. up to $1000 reimbursement for adaptive equipment plus 2 extra years of OnStar coverage. up to $1000 in adaptive equipment in new Chrysler, Dodge or Jeep vehicles. offers up to $1000 toward adaptive equipment. Making vehicles accessible for people with disabilities usually means wheelchair ramps or hands-free controls. People who are deaf have an invisible disability that can make driving a stressful experience. People who are deaf often refer to their eyes as “hawk eyes,” meaning their eyes see everything that people with normal hearing typically don’t even notice. While it may be true that sight and other senses are enhanced to make up for the missing hearing sense, it also means that everyday activities can be exhausting. When auto companies manufacture cars with features like the digital dashboard display that visually and audibly warns drivers of dangers or issues, these tricked-out features for the benefit of non-disabled people. Many of these features can be inadvertently helpful for drivers who are deaf or hard-of-hearing, but that isn’t their intended purpose. •Traffic sounds (horns, emergency sirens) converted into symbols on the head-up window display. •The same traffic sounds will also be sent as a vibration onto the steering wheel. While the technology has been developed to assist people with hearing disabilities, the vibration and visual displays can help all drivers, especially the early notification of emergency vehicles. Adaptive Accessibility pioneer Fithen and Corley would be amazed if they were around to see how far society has come in accepting and accommodating people with disabilities. The almost-daily invention of new technology unintentionally leaves people with disabilities constantly scrambling to keep up with the changes. It seems as soon as accessibility to one technology is gained, five new inaccessible technologies replace the now-accessible-but-obsolete technology. However, the innovation of the new MV-1 assembly-line-ready wheelchair-accessible vans and Hyundai’s technology that makes cars more accessible to people who are deaf indicates that having a disability is far less of a stigma than it was a hundred years ago. We have a long way to go, but with more accessible travel options, we will ALL get there.